On March 8, MSJ sophomore Palak Goel won first place in the 14th Annual Courage to Create Holocaust Art and Writing Contest. 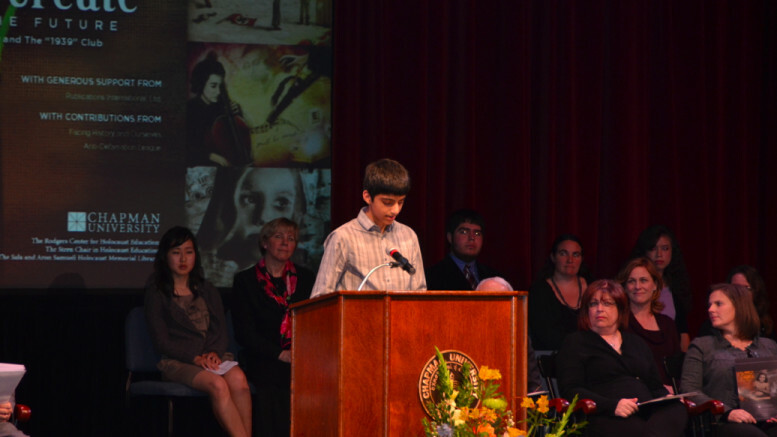 Palak’s journey began when English teacher Katherine Geers assigned a holocaust project. Students were tasked with finding a moving testimony of a Holocaust survivor by exploring the 1939 Club and the USC Shoah Foundation websites, two reputable archives of Holocaust survivor journals. After the students had completed and presented their projects, the class chose its favorite works to proceed to the next round of judging. English teachers Jennifer Moore and John Boegman hosted the same competition and had their students select the best poems. Out of this elite tier, Palak’s poem was among the few chosen to represent the school in the contest. Geers was elated when she received news that Palak’s poem had advanced to the finalist round and that he was being invited to Orange County to present it to a panel of judges. Reflecting back on Palak’s work, Geers said “I found his poem uniquely inspiring in that its message came from the heart and its ambiguity made its appeal ubiquitous.” Palak found the experience thrilling and said “I didn’t think my poem would go such a long way in the contest and I’m happy that the work and emotion I put into it could be heard by the judges.” Palak and the other winners will be given the opportunity to visit the U.S. Holocaust Memorial Museum and other sites in Washington D.C. later this June. Children whimper; their throats too dry. I don’t notice the flame. Victory, they whisper, is still in sight. Outside the fence, soldiers clash by night. I wonder which army is dark and which is light. And our angels will pour inside. I long for this silent new dawn. Will I laugh, and forget I cried? Or will, perhaps, my soul learn to fly? Be the first to comment on "MSJ Student Wins Poetry Contest"